Hi, welcome to use S26 Smart Plug EU(E&F)/US/UK/CN/AU Standard. Plug in and power up your S26 Socket. Select Quick Pairing Mode (TOUCH), tap Next. 6. Maybe the device is “Offline” on eWeLink, for the device needs 1 minute to connect to your router and server. When the green LED keeps on, the device is “Online”, if eWeLink shows still “Offline”, please close eWeLink and re-open. Turn on/off by tapping on device icon. Device status always simultaneous display on APP. How to make it possible? Firstly click Share, input the eWeLink account (phone number or email address) you want to share, tick the timer permissions (edit/delete/change/enable) you want to give, enter a note so that the other user knows who you are, then click Next. The other account will receive an invitation message. Click Accept, the device has shared successfully. The other user will have access to control the device. Read the detailed FAQ on Itead Smart Home Forum. 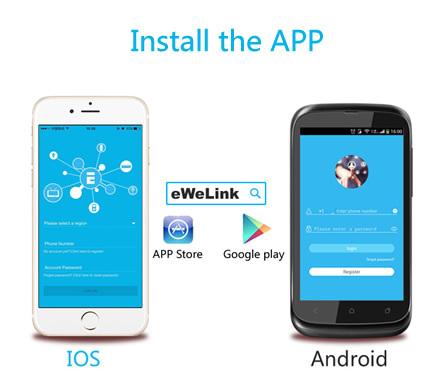 If the FAQ can’t help to solve your problem, please submit a feedback on eWeLink. Hi, welcome to use Sonoff T1 US 1-3 gang WiFi & RF wall touch switch！You can touch the switch on/off, or use App eWeLink/ 315MHz RF Remote to turn on/off. Use two screws to fix the back enclosure into the wall box. Then close the panel.